As a salute to the last 30 years, SLUG Magazine is hosting a celebration to bring together all of those who have helped make SLUG the strapping, savings-account-owning 30-year-old it is today. Similar to most people’s 30th birthday, SLUG has decided to spend it reminiscing on all the major moments in SLUG’s history by throwing the SLUG Magazine Time Warp. Hosted at Urban Lounge and Rye Diner & Drinks, the SLUG Time Warp will be a cornucopia of live music, games, activities and opportunities to bask in old memories while creating new ones. Turning 30—I’ve heard—is weird. There are these expectations of a mature, peaceful outlook on life that makes the rigorous nonsense of your 20s all worth it. I imagine all of these accomplishments are crammed into your 29th year, then the moment you turn 30, a raging desire to brew your own beer viciously awakens inside of you. However, SLUG’s journey to turning 30 has not been filled with cold-press juice cleanses and dabbling in microdosing, but it does have similarities to most millennials’ path to “adulthood.” SLUG was birthed by Gen-Xers and started its journey of self-identity through music, debuting as a punk rag in 1989. As the years have gone by, SLUG cultivated its love for local artists, athletes, chefs, self-starters, business owners, fashionistas and all the other characters who come together to make Salt Lake City (and beyond) a fountain of culture in the Utah desert. 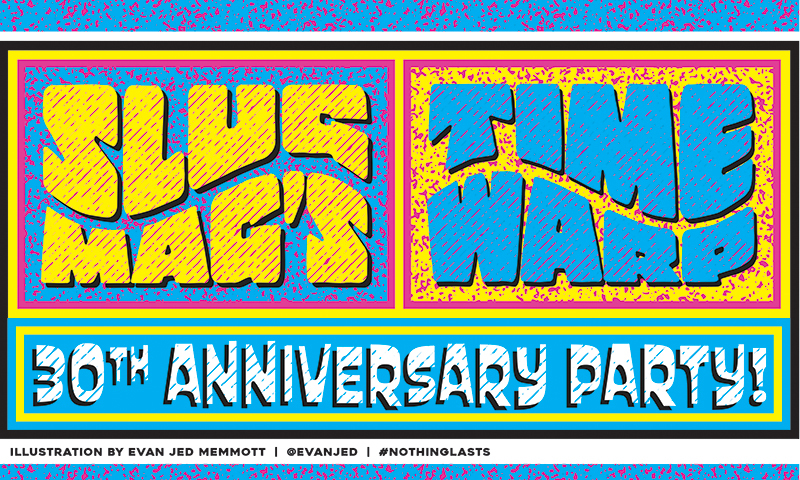 SLUG Mag’s Time Warp: 30th Anniversary Party! will be on Feb. 16, and the party will rage on from 8 p.m. to 2 a.m., with doors opening at 8 p.m. and music starting at 9 p.m. Entrance will be $5 at the door, and you can collect a free T-shirt with your entry. It would be easy to assume that a SLUG party will entail music in the punk or rock n’ roll realm, since that is what old SLUG is remembered for. However, the night’s music will include a large variety, including DJ Finale Grand, Cool Banana and Durian Durian. This lineup was selected to cover a wide range of music, similar to the wide range of music that SLUG has covered over the years. On the Rye side, (just north of Urban Lounge), the event will carry a similar but more relaxed mood. Local musician and community member Adam Sherlock will be hosting a SLUG Magazine “Cover Bingo,” offering attendees an opportunity to win prizes while enjoying the evocative, nostalgic past SLUG covers. In addition to SLUG Bingo, attendees can participate in the ”Build Your Own SLUG Cover” station provided by Smilebooth.